The Merci Train was a train of 49 French railroad box cars filled with tens of thousands of gifts of gratitude from at least that many individual French citizens. They were showing their appreciation for the more than 700 American box cars of relief goods sent to them by (primarily) individual Americans in 1948. The Merci Train arrived in New York harbor on February 3rd, 1949 and each of the 48 American states at that time received one of the gift laden box cars. The 49th box car was shared by Washington D.C. and the Territory of Hawaii. Parades and ceremonies of welcome were conducted in the state capitols and major cities of almost all the states. The largest and most attended was in New York City where more than 200,000 people turned out to welcome that state's assigned box car. 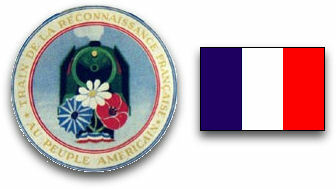 The symbol of the Merci Train to the right, shown next to the French flag, is a frontal view of a steam engine with flowers on the pilot which are symbolic of Flanders Field, where many American "Doughboys" from WW1 are buried. The drawing was adopted as the official symbol of the French Merci Train Committee, and a plaque of the drawing was placed on each of the Merci box cars. The committee also had gift tags made bearing the symbol, and one accompanied each of the more than 52,000 gifts that came in the box cars. In early 1949 there were at least thousands of World War 1 veterans and millions of WW2 veterans still living who had memories of spending as much as a week being transported to, or from, the battlefronts of the wars in that exact same type of boxcar. There were no seats, no windows, no toilets, and no sleeping or dining accommodations. Each man and his 39 traveling companions had barely enough space to sit down and they had to fit their bodies in rows to have enough room to lie down for sleep. 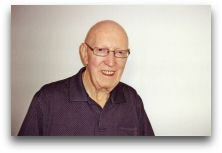 Most of the veterans that survived the war had memories (and some still have) of those final rides and conversations with buddies, including some who were killed and never made it back to the U.S.A. Those surviving veterans decided to make the little gift boxcars memorials to the those lost buddies and the sacrifices that they made to save the world from the tyranny of Nazism. Thus it is that, for more than 60 years, they have volunteered to keep the little antique boxcars repaired and honorably displayed in an effort to memorialize all that those who had given their all for the freedom of people everywhere in the world. I think that all of those heroes should continue to be honored by the continued preservation of these humble symbols of their sacrifices. I guarantee that anyone who volunteers to help with that preservation will be welcomed by those veterans who have stepped in to fill the gap created by the loss of most of the original caretakers who have grown old and died since 1949. For information on who to contact in your state, see that state's page in this web site. A description of all of the gifts that were in the box cars would fill many books, and the stories of the origins of those gifts would fill many more. To view an exceptionally well presented pictorial sample of the gifts that each of the 49 little French boxcars carried when they arrived in the USA, visit the online exhibit at the web site of the State Historical Society of North Dakota. Upon arriving there, click on the words "Launch Interactive Exhibit", then follow directions to photos of the gifts (Objects). The box cars themselves were antiques by 1949, having been built between the years of 1885 and 1901, which means that those still surviving today (2010) are more than 100 years old. This site has a photo of each of the remaining box cars and pictures of some of the more than 52,000 gifts that the train originally delivered to America. To view photos of any of the surviving boxcars, visit the "Merci Boxcars by State" link at the top of the page, then click on the links to the individual states. In addition to the photographs of the cars, the viewer will also find significant facts about each state's boxcar, photos of the gifts (if any are known), and the location, address and local contact information. The Merci Train played an important, but little known (today), role in the historical friendship that has existed between our two nations since before America gained it's independence. In fact the French people fought with us to achieve that status, and also gave us another gift which has become an important symbol of America's freedom around the world, The Statue of Liberty. It is the author's hope that his work about The Merci Train will revive interest in the story and remind people on both sides of The Atlantic that international friendship is an important commodity, and well worth the effort it requires to preserve it. The French, however, were not the only people of Europe to receive food from the 1947 Friendship Train, nor were the people of France the only ones to express their gratitude to the people of America in a meaningful way; soon after the first shipload of donated food arrived in Italy (on Christmas Day of 1947) an Italian film company made a documentary film showing the distribution of that food to their destitute citizens. The movie was sent to America with a request that copies be made and that it be shown in theaters across America, which request was complied with. A couple of years later, the Italian government sent a gift of four huge bronze sculptures in gratitude to America for help in ridding their country of their dictator, Benito Mussolini, and also for aid in recovering from the devastation the Nazis had visited on their nation. The statues were placed on the Washington, DC end of the Arlington Memorial and Theodore Roosevelt bridges (two on the abutments of each bridge). Also, sometime later, the people of The Netherlands expressed their gratitude to America by sending a gift of a large carillon, which is now located near the National U.S. Marine memorial in Arlington. As I recall from my visit there, the carillon is played every few minutes during visiting hours. I have read that the Netherlands, Belgium, and other countries also benefited from the Friendship Train. Other content on this site, such as images and/or photographs, may be protected under separate copyright.